While happily knitting away during one of our cohousing meetings, I realized that I could knit a clan hat for every person - child and adult - that would become a Belfast Cohousing and Ecovillage member. In our small coastal area of Maine, you will know the clan by their hats. How was I inspired to take up such a task as knitting everyone a hat? Years ago, on a visit to the Hudson Bay area of Quebec, Canada I was on the Cree Indian Reserve and stepped into an indigenous craft store. If you want to learn about a culture, I have discovered, check out what crafts they are engaging in... what artforms are they producing and sharing? I wasn't disappointed in my exploration of the Borealis Craft store as I left with a local photographer's night time photograph of an aurora borealis similar to the one I had experienced the night before in that vast expanse of northern sky. What was also in my bag was a finely crocheted cornflower blue hat, banded with a zig zag design emblazened boldly in bright contrasting colors complete with a large tassel hanging from the top. Aside from being beautiful, it was the label sewn into the hat and the story that came with it that sold me. I had purchased a "Pang" hat made in the Inuit settlement called Pangnirtung on Baffin Island. Baffin Island lies off the coast of Quebec but is officially part of the new Province of Nunavat. Pangnirtung is situated on a deep fiord that cuts through the mountain peaks of the Penny Ice Cap from Cumberland Sound to Auyuittuq National Park. Located at the arctic circle, the Inuit people experience long, snowy, dark, cold winters in this climate. Living close to nature and each other, the Inuit women had identified a brilliant way to locate their children, husbands and relatives at a glance in the snowy, all-white terrain... they each chose a color & a design which they knitted into hats and mittens their family wore. One glance at the children playing outdoors and they would know if any of the bundled children were theirs. Or one look out onto the waters to see what kayaks were coming home would inform them if it was their husband or father. I was humbled with the knowledge of how people in community all over the world come up with creative ways to solve problems. I cherish the idea that I own a Pang hat of an Inuit family. My hat came with the information of the family to whom my hat design belonged and also a thank you for contributing to the cottage industry that was helping to sustain their community. I was invited in the brochure to enjoy the warmth and beauty that came with these clan hats. 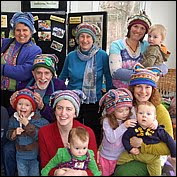 It was in one of these first meetings of Belfast Cohousing and Ecovillage that I realized that the colorful jester hats I love to knit with Maine Peace Fleece could become, like the Inuits, a tribal hat for our forming Ecovillage. We are in the process of building a village with the intention of living together in one place, while raising our children, and listening to the land and our elders as we figure out what living sustainably really means. As one member commented a few weeks back, "We are doing something really BOLD, RECKLESS and CHALLENGING." Maybe not living at the edge of the sea on the Artic Circle, but no less living on the edge of our culture as we explore what it means to bring the old concept of neighborhood back into our lives, to live intergenerationally caring for both young and old; living sustainably in energy efficient homes, and growing as much of our own food as the Maine summer allows us. What will living sustainably really look like at Belfast Cohousing and Ecovillage? I am excited and proud to be part of this bold, reckless and challenging project. We must come up with new structures of living if we are to birth the ecological era that is calling to us. May what we are forming at Belfast Cohousing and Ecovillage last 12,000 years and beyond as the Inuit culture has. Someday the children will be asking, just where did this design for a hat come from? How did our family end up with reds and greens and their family end up with blues and purples? Let us hope we are knitting together something that will endure and be generative. You too could have a clan hat! A declaration can change the world. Hard to believe that it’s been only about a month since we finished our “BELFAST COHOUSING & ECOVILLAGE DECLARATION OF CONDOMINIUM.” So much has happened in the last month and a half that it seems like it must have been a year ago. We’ve brought in six new equity-member households and five new exploring-member households. We’ve had two packed, family-oriented Open Houses. We’ve honed in on the final floor plans for the homes and the Common House. We’ve had the first of our new, monthly, consensus-decision-making conversations. We’ve had a two-hour, heart-felt conversation on what sustainability means to us. We’ve confirmed the importance of a barn and a root cellar in our lives. We’ve wrestled with the location of unheated storage (garages). We’ve done energy analyses of the proposed Common House. The list goes on… For me, the most palpable growth over the last month has been our “maturing” as a group in the face of the ever-tougher decisions leading up to our planned spring ground-breaking. Have you forgotten about the Declaration, yet? Our Declaration, unanimously accepted on January 28, 2010, is a cornerstone now in place. Life has been full in other realms, too. Cat (7 yrs old) and I moved out of our cabin to try to "finish" it; I am selling my home in Cobb Hill Cohousing; I am organizing a May workshop on "Communicating Oneness" with Robert Gonzales (an internationally renowned Nonviolent Communication trainer); and I am planning a Texas-Utah-Montana visit to family in June. After the June trip, perhaps Cat and I will stay in Boston a few days so that Cat can see the big fireworks on the Fourth of July. Another Declaration comes to mind: our country's Declaration, unanimously accepted on July 4, 1776. Probably not the sentence that you thought would jump out at me. But, then again, you may not have been thinking about the dominant, voting culture as much as I have been lately. Bend your ear close, so I can whisper in it. Did you see the two, little, sneaky, barely noticeable words after “may be amended only by vote?” Now, that’s the stuff of revolutions! “Or agreement”—those two little words in our cohousing Declaration. “Agreement,” “consent,” whatever you want to call it, there’s a power and greatness in coming together and declaring with one voice. Our cohousing Declaration references another of our foundational documents, also recently completed—the Bylaws. The Bylaws tell a bit more of the story (ten words, instead of just two). If you’re finding yourself wondering why I think that “agreement,” “consent,” “consensus”—whatever you want to call it—is so revolutionary, you may be one of the many who has experienced the dominant-culture version of consensus. The dominant-culture version of consensus consists of endless meetings in which one person after another rattles on about why they think the group should do “this, that, or the other thing.” Once everyone is thoroughly exhausted, the person with the hardest “but(t)” wins “agreement” to their view, and everyone “consents” to go home. I find that type of “consensus” (an autocracy of the “hard but(t)s”) a revolutionary way to destroy life (energy), liberty (from meetings) and any semblance of happiness. Give me a dominant-culture vote any day over, what I fondly refer to as, “death by consensus.” I’d even prefer to live under a dictator (at least a “benevolent” one). Here's another vision of consensus—a revolution worth fighting for. Picture every person being held sacred. Picture every person honored. Picture every person supported. Picture every person equally valued. Picture us making decisions that consider everyone of us. No casualties. No blood. No one ignored. No one left behind (really, this time). No need for a but(t) of steel. There’s a guy I once met who liked to say, “You can pay now, or you can pay later with interest.” He was a recovering alcoholic, and he was talking about dealing with feelings. We live in a debtor’s culture (another aspect of the dominant culture). We want what we want NOW, and we’re willing to pay later. We rarely add up the interest payments to calculate the true price we’re paying. The governance models with which we’re most familiar—Autocracy and Democracy—work well in a culture in which we want a decision NOW (and we proceed as if that immediacy will be free, without a future interest payment). Autocracy (decision-making by one person or a tiny group) is the speediest form of decision-making (think corporations, small countries, and most families). This form of decision-making is also usually the most costly in the long run (think revolutions, rebellion, and ecosystem devastation). Democracy (decision-making by voting) is the next quickest to deliver a decision. In democracies, half of the people are happy half of the time, and decisions last until the “under” half can overthrow the “over” half and, thereby, reverse the “dominator” and “dominated” roles. Are either of those models truly serving us? Time for a revolution in our evolution. What if we pay up front? What if we take a little extra time in the making of a decision so that everyone feels okay about the decision upfront? Will endeavoring to make all our decisions by consensus doom us to endless meetings? I think not. I predict that as we get better and better at “true” consensus, our meetings will enliven, energize and excite us. We’ll start to see each decision as a creative, problem-solving adventure: a puzzle for our hearts and minds. In my opinion, endless, energy-draining meetings, labeled as consensus decision-making, occur because, for most of our lives, most of us have lived in autocracies and democracies. In those systems, winning people over to our side is the only way to get our needs met. We like the idea of everyone agreeing, but, because of our conditioning, we think that means getting everyone to agree WITH US, with our view, with our way of seeing something. We want “consensus” (really a unanimous vote) for the option that WE like the best. Our founding fathers didn’t say anything about voting in their Declaration—they just said “…to secure these rights, Governments are instituted…, deriving their just powers from the consent of the governed…” In our country, most of us have consented to use Democracy which has then shaped the very way that our minds work. We’ve forgotten that our consent (consensus) underlies the choice of which form of governance we’ll use. So, what is consensus, if it’s not getting everyone to see things “my way” (or “someone else’s way”)? Here’s how I see it: Consensus is putting the ALL the ways that we all see a situation into a single pot and then owning that whole pot together. It’s recognizing that my needs are best met when my neighbor’s needs are also met. It’s an acknowledgement that all of our perspectives are equally important and that we want to take them ALL into account. It’s letting the tension of seeming incompatibility propel us into new realms. When it comes to tension, Peter Senge of MIT (Learning Organizations) likes to use the analogy of a rubber band. When there’s tension on a rubber band it has potential energy. Tension in organizations also indicates the existence of potential energy. When we notice tension, we have options: 1) We can leave the tension in place (static, stuck); 2) We can increase the tension until we reach the breaking point (system failure, chaos, revolt); or 3) We can release the tension and zoom into previously unimagined realms. We are interconnected and interdependent. We are learning and creating. How we choose to live will change the world.